Email arrived into our lives in the early 1990’s, and has become a ubiquitous form of communication for all of us. It’s a testament to the brilliance of email that even today, with hundreds of instant messaging apps and a similar number of social networks, people still turn to email to communicate. Such is the popularity of email, that we often expect our email clients to behave just like those popular instant messaging apps or social media platforms. The truth however, is that email does not work like an instant messaging app. Whilst most of the time email appears instant, sometimes a particular email can take minutes or even hours to arrive in your inbox. Email was never designed to be instant, so we shouldn’t be surprised if occasionally emails take a while to be delivered. When you send an email, it is sent over a series of servers until it reaches its destination. 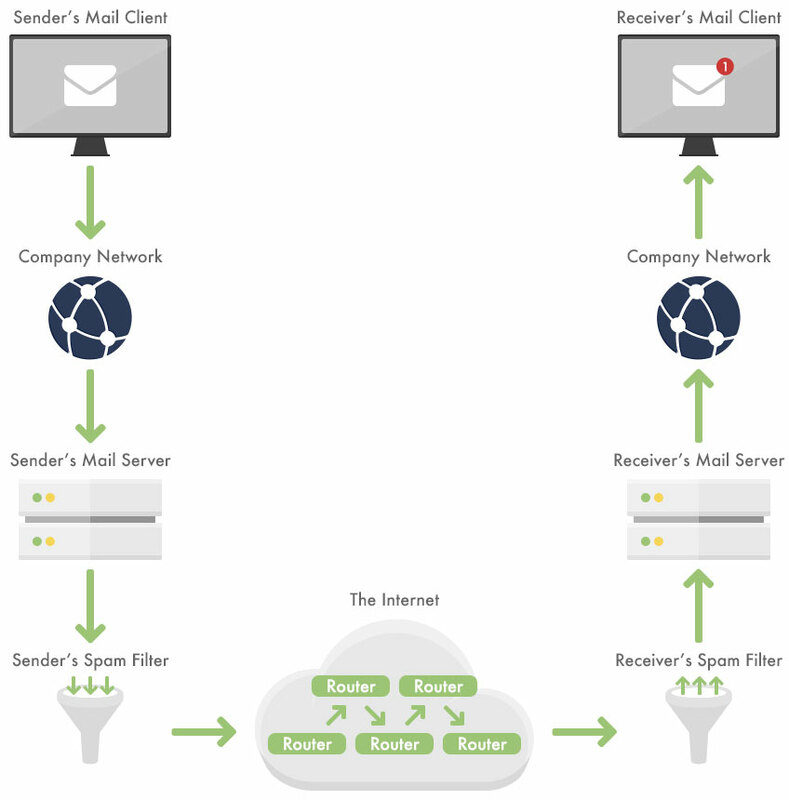 The number of servers involved in sending an email can vary, depending on your location and ISP, amongst other things. If any server in the chain is down, or running slowly, this could have an adverse affect on the delivery speed of your email. Thankfully email has been designed so that if servers go down, it doesn’t go missing. Instead it will keep retrying the server, or in some cases be rerouted to a different server until the mail can be delivered. Most email clients have features to help prevent spam, usually involving moving any suspicious emails to a specific spam folder. We recommend enabling this feature inside your mail client if you haven’t already, as this will help cut down the amount of spam in your inbox. We also recommend reviewing your spam folder on a routine basis, as sometimes legitimate email can be filtered into your spam folder. The speed of email is something we get asked about a great deal. More often than not, these speed related issues are directly related to the size of your inbox. Simply put, every time you open your email client (such as Outlook, Thunderbird, Mac Mail or webmail) it checks your email server for new mail. Once open, your mail client will continue to check for new mail at frequent intervals. If you have 20 emails in the inbox, this check will happen much faster than if you have say, 20,000 emails. Webmail in particular can be reduced to a crawling pace if your mailbox contains thousands of messages. In order to keep your email client running at top speed we recommend deleting all the emails you don’t need. We also recommend archiving any emails you wish to keep, but don’t necessarily need quick access to. There are a number of reasons why attachments can slow down the speed of an email. When the sender sends their email, the attachment has to be uploaded to the mail server. The speed of this process is dependant on the upload speed of the sender’s connection, and the size of the attachment. Once the attachment has been uploaded to the server, it will go through the same processes as a regular email, only it will have to be downloaded by the receiver, which is again dependant on the speed of the receiver’s connection, and the size of the attachment. Email works best when small, simple messages are sent from one email address to another. As such, we recommend only sending large email attachments as a last resort. If you wish to transfer large files, we recommend using a service like Dropbox or wetransfer.com instead. These types of services are designed to deal with large files, something email is not. If you have an urgent or time sensitive email, we recommend using other forms of communication in conjunction with email. For example, if you have sent an important email, its good practice to follow it up with a phone call or instant message, to double check your email has been received. If the email recipient has more than one email address (perhaps with different providers like Gmail, Yahoo etc), consider sending the mail to some or all of those addresses, to maximise the chances of your email being delivered quickly.